Those wacky Coens are at it again. And those serious Coens. And those loquacious Coens. The Ballad of Buster Scruggs, a paean to pre-revisionist Westerns, allows the Oscar-winning brothers to try out nearly every weapon in their considerable arsenal. A six-part anthology, The Ballad of Buster Scruggs is inconsistent but almost always entertaining. The movie strikes an effective balance between satire and homage and mines the most common ore of the old-time Westerns of John Ford and his brethren. Or maybe Roy Rogers. The opening segment, “The Ballad of Buster Scruggs,” may be the best the movie has to offer. In addition to an offbeat, openly humorous bent, it clocks in at a skinny 15 minutes. Tim Blake Nelson plays the title character, a combination gunslinger-singer, who often warbles a song before or after a kill. He’s always smiling and good natured – even if you cross him, he’ll retaliate good-naturedly. As good as any of the Coens’ comedies, this gem gets the movie off on the right foot. "Near Algodones" is a step down but not a steep one. James Franco plays an unnamed outlaw who underestimates the teller (Stephen Root) at the isolated bank he attempts to rob. The teller, not one to take thievery lightly, dons home-made armor made out of pots and pans and turns the tables on the criminal. The segment, which is about the same length at “The Ballad of Buster Scruggs,” highlights the Coens’ sardonic wit, especially when Franco delivers a memorable quip from the gallows as the episode draws to a close. Things get dark and strange with "Meal Ticket," the most macabre of The Ballad of Buster Scruggs’ shorts. In this one, the barely vocal Liam Neeson plays an impresario who travels from settlement to settlement staging shows featuring the quadruple amputee (no arms or legs) who shares his wagon. This artist (Henry Melling) uses his powerful voice to recite poetry, famous passages from books and speeches, and The Gettysburg Address. Over time, the initially large and enthusiastic crowds dwindle to a few disinterested stragglers. The chapter’s 20 minutes is too generous for the material, forcing us to sit through multiple iterations of the show and, although the Coens’ have points to make about short attention spans and people’s love of the lurid, there’s something heartless and mean-spirited about the segment. "All Gold Canyon,” based on a Jack London story, is the movie’s most visual and relaxed segment. For most of the running time, there’s only one character: a prospector played by Tom Waits. Despite giving cinematographer Bruno Delbonnel a chance to shine, there’s not much to this episode and it feels like filler. At nearly 40 minutes in length, "The Gal Who Got Rattled" is The Ballad of Buster Scruggs’ longest and most complete tale. It’s also the most action-oriented episode with the best character development. If there’s a story that’s the least “typical” for the Coen Brothers, this is it – a straightforward Wagon Train-type narrative with a little romance, a little tragedy, and a lone gunman standing against a Native American hunting party. (Actually, in this context, it would be fair to call them “Indians.”) Zoe Kazan plays the title character, a young woman making a long trek across dangerous territory on her way to an arranged marriage. Along the way, she falls in love with one of the men protecting the wagon train; he proposes an alternative to her uncertain future and his own vagabond existence. His partner, however, shows signs of jealousy when he realizes the impact of this romance on his existence. Things close with the dialogue-rich "The Mortal Remains,” which follows the interaction among five passengers (four men and one woman) confined in a coach on its way to a frontier fort. Played by Jonjo O’Neill, Brendan Gleeson, Saul Rubinek, Tyne Daly, and Chelcie Ross, they trade barbs and share life philosophies as the vehicle races along and the inside of the carriage increasingly seems too small for so many outspoken opinions. This final episode’s tone and length are more similar to the opening two than the three in between. Despite the humor, the off-kilter banter, and the satire, The Ballad of Buster Scruggs is a pretty brutal affair. Dead bodies abound and, although the shortness of the episodes works against bonding with any of the men and women populating these stories, their life expectancies make character identification unrewarding. The film trades in nostalgia in the way it forcefully rejects the “enlightened” re-interpretations of How the West Was Won. This is pure Cowboys & Indians, Coens’ style, and that means the joke’s on anyone who doesn’t understand the parody inherent in that approach. Netflix’s generosity (the movie initially began life as a six-episode series before the writer-directors compressed everything into a feature film) allowed the Coens to be more playful than is usual even for them. As with many cinematic experiments, some things work and some don’t. 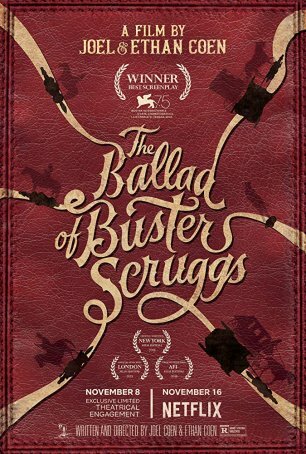 The Ballad of Buster Scruggs contains two out-and-out winners (“The Ballad of Buster Scruggs” and “The Gal Who Got Rattled”), two slight-but-entertaining offerings (“Near Algodones” and “The Mortal Remains”), and two that might have been better left on the cutting room floor (“Meal Ticket” and “All Gold Canyon”). In a theater, with no fast-forward button in sight, the film might seem to run a little long. At home, however, where skipping ahead just requires the swipe of a finger, The Ballad of Buster Scruggs is music to the ears.